Kymberly Wimberly graduated from high school on May 13, 2011 from McGehee Secondary School in Arkansas. Except for one B in English, she earned straight A’s. Many of her classes were Advanced Placement and honors courses. Since Kymberly had the highest Grade Point Average at the school, she was told she would be the class valedictorian. The last African-American valedictorian in the McGehee School District was in 1989. A press release was issued announcing Kymberly’s accomplishment. Coincidentally, it was sent out by her mother who works at the school as a media specialist. Word spread quickly and within a few days, the school’s principal told Kymberly that a white co-valedictorian was being named – a student with a lower GPA. Kymberly’s mother, Molly Bratton, attempted unsuccessfully to appeal the decision to the school board. She was told that she could address the board at its next meeting at the end of June. Kymberly graduated in May 13, 2011 and now attends the University of Arkansas at Pine Bluff in the Science Tech Engineering and Math program. In July, 2011, Kymberly and her mother filed a discrimination lawsuit against the school claiming a violation of her 14th Amendment equal protection rights. The school is predominantly white with 46% of the students being African-American. 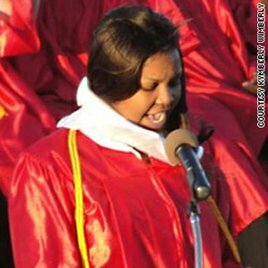 Kymberly’s mother claimed hearing comments about her daughter’s race and the “big mess” that would result from her designation as class valedictorian. Kymberly seeks punitive damages of $75,000 from the school. Punitive damages are defined as money awarded to an injured plaintiff in a lawsuit that is considered punishment for willful behavior, in order to set an example for others. For an interview with Kimberly about her accomplishments through high school and the challenge of having a baby when she was a junior, see here. That sounds like something that would have happened back in the 1950s. I hope she wins her lawsuit.